For years the “paperless lifestyle” has been a buzzword among environmentalists and a goal to shoot for by the masses. Recently however, our iPhones and iPads have made this goal more attainable. Surprisingly the camera technology housed within each device is spearheading this paperless movement. How so? Apple’s precisely tuned cameras can be used as scanners. That means all your bills, receipts, and other loose papers can be scanned in and retained digitally rather than physically. One company that is leading the way in this regard is Smile Software. Known for there fantastic optical character recognition (OCR) algorithm, Smile’s portfolio contains some of the best apps to assist your paperless endeavor. If you’ve used PDFpen Pro on the desktop, you’ll be happy to know Smile has a great supplementary app for iPhone and iPad called PDFpen Scan+. 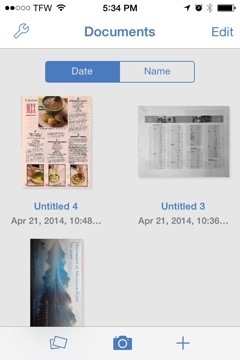 PDFpen Scan+ is just one of our favorite scanner apps for iPhone and iPad. We’ve collected all of our favorites here. And if you’d like to see more of our top app selections in different categories, just head on over to our Best Apps Series. 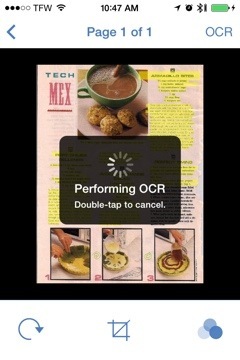 While there exist many scanner apps in iTunes App Store, we were hard pressed to find one that does OCR. Why do most apps lack this ability? Most likely because accurately OCRing is a daunting feat. You see, the app needs to be able to recognize text in a photograph, then match letters correctly to a database, and finally embed those words back into the image as highlight-able, searchable PDF text. This is no problem for PDFpen Scan+. After launching the app, choose how you want to import an image, either by taking a picture, choosing one from your photo library, or downloading from a number of cloud services like Dropbox. 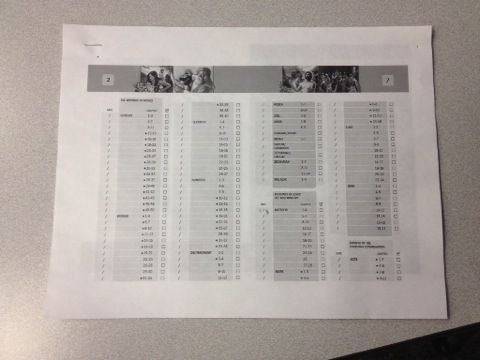 Creating a document from the camera allows for sequential pages to be added to the PDF by taking multiple photos. PDFpen Scan+ will automatically find the edges of your document for cropping. You can also manually adjust these borders for fine tuning. I do wish a magnifying glass appeared when moving the borders to show the image being blocked by your finger. Yet, as of this writing, no such feature exists. From the main documents view, tap on a PDF to access more options. 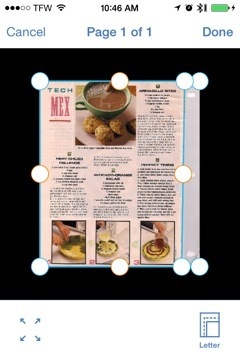 Additional pages can be added to your PDFs by tapping the plus sign in the lower right corner. Pages can also be rearranged and deleted. In this main PDF view an OCR button will generate and embed text from the whole document. Or tap on one of your PDF’s pages and you will have the chance to OCR that one page, rotate it, or adjust the color settings. Once finished with your PDF, the app will sync it to your other PDFpen apps via iCloud, shoot it to other apps on your device, or online storage services like Evernote and Google Drive. On the journey to a paperless lifestyle, PDFpen Scan+ is a extremely functional tool to add to your utility belt. The OCR capability is amazing and will make all your PDFs searchable with highlight-able text. The PDF management features round it out into a must-have app for anyone looking to organize their life with an iOS device. Check it out today.